Sometimes there is nothing better than a good homemade meatloaf recipe. For me, homemade meatloaf that has been what I have so often wanted as my comfort meal. When I was growing up I loved meatloaf. 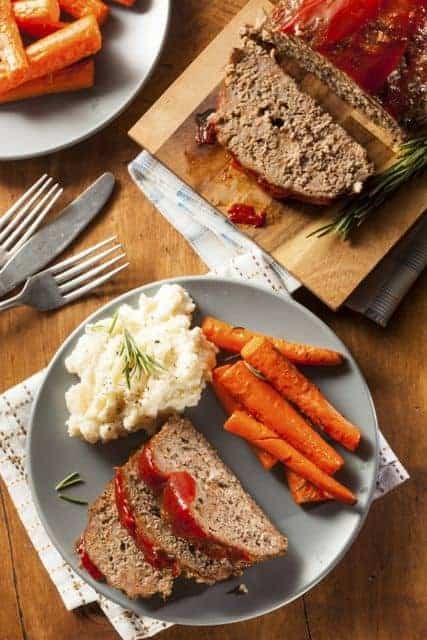 I loved how my Grandfather would make a meatloaf and he would make this ketchup topping. When I was young I thought it was meatloaf icing, it wasn’t, it was just ketchup. His meatloaf was amazing. It had only simple ingredients with just one type of meat, beef. He would prepare this with mashed potatoes, and some other vegetables that had just come out of the garden. This was a meal that I fell in love with when I was growing up. This recipe is made very simply, I use ground chuck, eggs, milk, and we saute our vegetables before we add them. I think by cooking the vegetables beforehand the onions, carrots, and celery get the chance to caramelize in the pan, and this really yields some wonderful flavors. I also use Italian breadcrumbs for this recipe. This adds some additional flavor. This meatloaf recipe is fairly simple, but I think cooking the vegetables makes all of the difference. Instead of using ketchup Heinz 57 sauce is amazing on a meatloaf. You may also want to add some chopped garlic to your vegetables when you saute them. You could also add in some green bell peppers when you saute your vegetables. If you don’t have Italian seasoned bread crumbs, you could use plain bread crumbs or even some cracker crumbs in the place of the Italian seasoned breadcrumbs. I have to be honest, meatloaf for me isn’t a dish that I love. It all stemmed from experience when I was in high school. We had moved to Texas and my Mom had a very small kitchen. It is difficult in moving from a large kitchen to one that is very small. She stored baking pans under the kitchen sink. This will soon become significant. My Mom used the sink one day to store cleaning water in. Pinesol was the cleaner of her choice. This will also become significant. My Mom was known for making a really good meatloaf. She would put all sorts of special ingredients in there, herbs, spices, and she always topped it with ketchup. It was always a great meal. One day it wasn’t so great. She made her special meatloaf. We all sat down for dinner to enjoy this delight. You might wonder what Pinesol tastes like. I am her to tell you it tastes exactly like it smells. When I took a bite, the flavor was horrific. It wasn’t until everyone took a bite of the meatloaf that my horror was realized. Apparently, the pinesol dripped from the sink and into the pan and had dried. I must say for years after this was a dish that I couldn’t eat no matter how much I tried. It took until I was in my 20’s until I was able to try meatloaf again. You have never had meatloaf that was so easy to make. Preheat oven to 350 degrees. Saute vegetables in butter over medium heat. Add 1/2 teaspoon of salt to the vegetables. When the onions are translucent and the remaining vegetables are soft turn off the heat. Combine in a bowl ground chuck, 2 beaten eggs, milk, vegetables, and seasoned bread crumbs to the bowl. Stir to mix well. Add salt and pepper to meatloaf mixture and blend seasonings in well.Pat meatloaf into a greased loaf pan. Bake for 60 minutes. Remove meatloaf from oven. Add ketchup to the top of the meatloaf and spread out evenly. Bake for another 15 minutes so the ketchup caramelizes on the top. Ha Ha Ha, loved the pinesol meatloaf story. That sounds like the kind of stuff that happens to me. I can’t wait to try your recipe, I know what’s for dinner tomorrow now. I have an induction burner I have used a few times. I mostly use gas. Great tip on the topping of barbeque sauce. Not knowing what pine of mashed potatoes were I typed it in and “Nothing’. Are you going to list the recipe? I don’t recall saying anything about pine of mashed potatoes, I did mention my Mom’s meatloaf tasted line Pinesol the cleaner. In the meatloaf ingredients the amount of milk is not listed. However, in the instructions it is. Thats the same pan I purchased off the internet. No pan preping is required. Just place the meatloaf in the pan and bake. It slips out of the pan like butter. The pan is worth every penny I paid. It is a great pan isn’t it? I love it. Thank you for your receipies! I made your Olive Garden salad dressing, and it is delicious! Thank you. Thank you. I am glad to hear you enjoyed this recipe. Meatloaf is still, and forever, the ultimate comfort food! Lydia, it is definitely a favorite of mine. I love it when it is served with a pine of mashed potatoes. I usually top mine with crushed tomatoes. That all looks so delicious. Great suggestion Leela! I never thought about using crushed tomatoes. I will have to give this a try. What do you like to top your meatloaf with? Catsup, Brown sugar, a little vinegar.